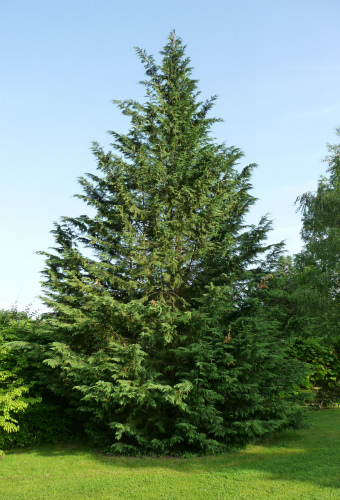 Noted for its rapid growth and slender shape, the Leyland cypress has found wide popularity over a large range of the United States. It grows well in a wide variety of soil and climate conditions and makes an excellent wind break as it provides a dense barrier with good color all 12 months of the year. This sterile hybrid is produced in great numbers for use in Christmas tree plantations, in windbreaks and along boundary lines. It also beautifies the landscape around homes, across campuses and in parks. Features dark green to bluish-green, scale-like needles that are flattened on evergreen sprays, pointy at the tips but notably soft. Produces small, globular cones that are ½–¾" in diameter and made up of 8 scales. Is a popular choice for hedges and boundaries but requires annual pruning. Can be pruned and shaped repeatedly without harm. Grows in an oval or pyramidal shape if not pruned. 40-60 ft. x 20-25 ft.
grows well in acidic, alkaline, loamy, moist, rich, sandy, well-drained and clay soils.